High blood pressure (also known as hypertension) is the health condition of having blood pressure readings above 140/90 mmHg, over a number of weeks. High blood pressure is a major health risk because it puts extra strain on your heart and blood vessels. People with high blood pressure are susceptible to stroke, kidney diseases and heart failure. 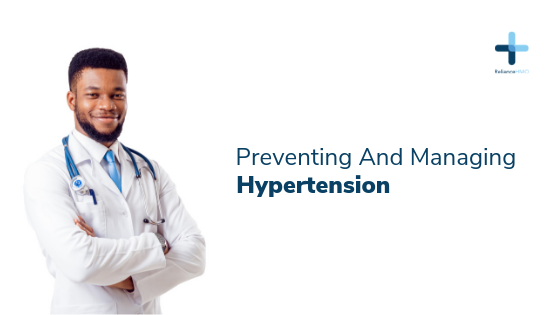 It is popularly called the silent killer for good reason; high blood pressure gives no direct signs or symptoms. Diet and stress are the main precursors of high blood pressure. People with unhealthy eating habits and stressful lifestyles are advised to check their blood pressure monthly. Besides serving as a reminder to live healthy, frequent blood pressure checks can help you detect this health condition, so you can take steps to lowering it. 1) Lose some weight – Blood pressure often increases with body mass index. Being overweight disrupts breathing while sleeping (sleep apnea) in some, this further raises blood pressure. Weight loss is an effective lifestyle change for controlling blood pressure. 2) Exercising regularly – Frequent physical activity for 30 minutes on most days of the week has be proven to lower blood pressure by 4-9 mm HG. Consistency is important for people diagnosed with high blood pressure, stopping may lead to a relapse. Cycling, jogging, walking, dancing and walking are some of the best types of exercise for lowering blood pressure. 3) Eat a healthy diet – A change in the diet is recommended by physicians advising on lowering high blood pressure. Consume more whole grain meals, vegetables, and low-fat dairy products. Salt and high blood pressure are not good friends. Cut salt from your meals gradually and substitute with natural spices to reduce blood pressure. Reduce the size of your meal portions; eat foods low in cholesterol and saturated fats. 4) Quit smoking, decrease alcohol intake, and reduce caffeine consumption – Regulate habits like smoking, alcohol consumption, soft drinks and caffeine intake. Smoking is a habit that must go; nicotine increases the blood pressure, heart rate, narrows your artilleries and makes your blood more likely to clot (this sets you up for an heart attack or stroke). 5) Reduce your stress – Chronic stress is a top contributor to high blood pressure. Try to figure out what causes your stress. Try organizing possible causes, such as family, work, illness and finance. Once you determine what causes your stress, start considering how to eliminate them. 6) Potassium rich food – Eating potassium rich fruit and vegetable helps in lowering blood pressure. Tomatoes, potatoes, bananas, beans, peas and dried fruits such as resins are rich sources of potassium.